Above and below: Production shows in the Silhouette Theater. Above and below: Specialty performances are incorporated into the production shows. Above: Visiting artist David Meyer performs in a muli-media concert. Below: Comedian Rob Magnotti performing in Silhouette's Celebrity Central theater. Above: The ship's dancers perform in a 70s night interactive theme party in the Sky Lounge. Below: Silhouette also has an array of musical performers including its an acappella group who play in venues throughout the ship. Celebrity Silhouette's programming is part of what the cruise line calls "Celebrity Life." This term encompasses a wide expanse of activities involving the ship's culinary operation, the spa and other shipboard operations beyond the entertainment. All of these are intended to interrelate, creating an overall atmosphere of sophisticated luxury. Cruise director Paul Baya is in charge of the entertainment on Silhouette and explains that its programming seeks to "maintain an element of fun [while] catering toward an intellectual demographic." His work involves presenting offerings that Celebrity's sophisticated clientele would regard as "cool." From these, "the guest can choose what type of cruise experience they want to have." Although the whole is designed to be greater than the sum of the parts, it is illustrative to talk about some of the highlights of Silhouette's entertainment offerings. 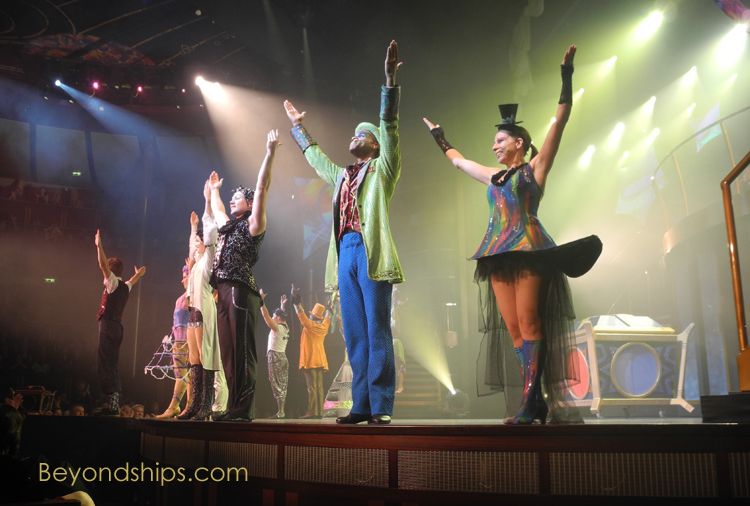 The cornerstone of evening entertainment on any cruise ship is the shows in the ship's main theater. "We have three main production shows. Tomorrow, we have 'Broadway Nights.' That is songs from Broadway and London's West End - - Le Mis, Phantom of the Opera, Cats, Mama Mia. In the high energy show - - 'Velocity' - - the theater becomes the performance arena with the bungee jumping over the audience maybe ten or twelve seats out into the theater. There is also a Cirque du Soleil- style show, that is 'Silhouette The Show." "Each of the [Celebrity] ships will have that type of Cirque show, Broadway show and the high energy one. But they are not all the same show. There may be some of the same elements but it is more or less a drastically different show." Indeed, woven into the shows are performances by specialty performers such as acrobats, jugglers, and unicyclists who have their own unique skills. Thus, not only are the shows different in that respect from ship to ship but each show changes when an individual specialty performer leaves and a new performer comes to take his or her place. "For the most part, the choreography by the ensemble cast remains the same but now you can interject a brand new [specialty] routine. There is that flexibility within the show - - we have the ensemble cast performing but here is a [new] specialty act. It is not a gymnastics routine where at this point [the performer has] to turn and point." Consequently, the show becomes a new experience even for passengers who have traveled on Silhouette before. In addition to the production shows, the Silhouette Theater is used for shows by visiting guest performers. "We have a nice variety. Celebrity is very good with the cabaret entertainers that they send out here. They have a good track record. I have worked with many of them before." The acts are selected keeping in mind the type of passenger who sails on Celebrity. "It is: 'what can you breathe in that is something that is classified as cool - - something different without being off the wall.' I think that they are looking to have those acts that have some type of new vibrancy to them and not just your old school." "Although we do have comedians, with the international clientele that we have on this ship, maybe a stand-up comic is not best suited for the main theater. But an action comic or a comedy magician who can support their comedy with some visuals, you can still enjoy regardless of what language you speak. Let the stunts and the novelty performance speak for itself. Straight stand up is very difficult across an international clientele." "You also see a lot of shows that are family friendly. Even for the late night comedy shows, I say you can be suggestive without being offensive. I let them push the envelope sometimes. But the last thing I want to hear is that someone was offended by a late night comic. I want guests to go see a comedy show and not be afraid to sit in the front row." Mr. Baya believes it is important to follow-up on any concerns guests express about the entertainment. "If a few guests get offended, I want to acknowledge their concern, erase the tension and follow up. I think this is what drives the cruise industry - you get this one-on-one attention and follow up. You don't see that in a lot of hospitality areas. We would love for them to have a good experience and book again with Celebrity Cruises. I like that attention to detail." Nighttime entertainment on Celebrity Silhouette is not limited to the shows in the Silhouette Theater. One type of event featured on all the Solstice class ships is interactive theme parties. These events are held in various venues around the ships and feature performances by the production casts in which the guests can join. As with the production shows, the interactive theme parties vary across the fleet. "The Solstice has 'Sizzle,' the Latin one, and 'Grove', the 60s interactive party. The Eclipse has their Motown party and a show called 'Mask"
"On this vessel we have the 70s interactive party involving the dancers and the DJ but still there is that production value to it. The dancers are all in costume and stick around to show you some of the dances." "The 'Celebrity Rocks' event speaks for itself. I consider that a 35 to 40 minute, miniature production show. It involves the singers and the dancers, formal choreographed routines. It is just not in the main theater. Ideally, it is out poolside weather permitting or inside in the Grand Foyer. It is a nice full-on production. Afterwards the guests are all fired-up and can join in on the dance floor." Silhouette also has the traditional evening game shows such as a game inspired by the old television show 'The Newly Wed Game." However, using new digital technology, it is also able to have new games in which the entire audience can participate. "It is called ARS - - audience response system. It allows us to put some stuff up on the screen, ask the question and you have ten seconds to answer. Everyone is sitting there with a controller in their hand and they are able to chime in with the answers. We can have a game show set up where we separate the men from the women or these three sections [of the audience] or however we want to do it. You see the results - - who is the quickest responder; who had the most questions right; who had the most wrong. That is one unique feature." "Also, we have a game show media system similar to that of Jeopardy. Chris of our activities staff has really grown into that. I'm laughing a lot with his banter and I am looking to speak with our broadcast technicians to see if we can record some of those and share those on the T.V. for more guests to see. There are some unique opportunities beyond a normal trivia. We are able to make it more cool with the technology that is available."